H.E. 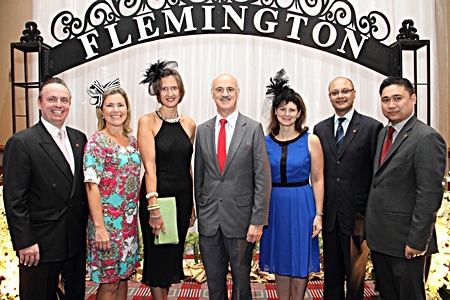 James Wise, Australian Ambassador to Thailand was guest of honour at the annual “Melbourne Cup 2012” charity event held at the Amari Watergate Bangkok recently. The affair organized by the Australian and New Zealand Woman’s Group (ANZWG) under the leadership of President Anne Sidwell, raised funds to support the Northern Mobile Dental Clinic based at Mae Sariang Hospital under the Smiles on Wings Project. (l-r) Pierre Andre Pelletier, the hotel’s GM, Leanne Whittingham, Anne Sidwell, H.E. James Wise, Kirsty Gardner, Alex Siju, the hotel’s EAM and Chewin Mitpirom, Director of F&B.